DrayTek Wireless Access Points allow wireless capable devices and wired networks to connect through a wireless standard, including Wi-Fi or Bluetooth. WAPs feature radio transmitters and antennae, allowing connectivity between devices and the Internet. VigorAP 902 Dual-Band 802.11ac Wireless Access Point The DrayTek VigorAP 902 is a wireless access point which can be operated in standalone or centrally managed/monitored mode (with the use of a central DrayTek management product - see later). The VigorAP 902 is a high specification professional access point providing reliable and flexible coverage to all manner of applications. A vast array of security and management features helps the AP to improve and protect flexibility and integrity of your wireless LAN. The VigorAP 902 is ideal for adding wireless connectivity to an existing LAN, or for expanding the range of an existing wireless LAN by using the WDS repeater features. Simultaneous Dual-Band Operation & Extended 5Ghz Bands The VigorAP 902 supports simultaneous operation of the common 2.4Ghz band and faster 5Ghz band. The 5Ghz band is far less congested so if your PCs or other devices support the 5Ghz band, you can use that. The 5Ghz band is used for 802.11ac (or optionally 802.11n and 802.11a). The VigorAP 902 operates both bands at the same time, allowing your devices to use either band and each has its own bandwidth so overall wireless capacity is also increased. The 5Ghz interface supports the full range of extended domestic 5Ghz channels, thank to its support for DFS/TPC; you can select all 5Ghz channels up to channel 140, as opposed to just the 4 'Band A-Lower' channels (which provides only two non-overlapping channels). Gigabit Ethernet Ports The VigorAP 902 has five wired Ethernet ports (separated into two distinct separated LANs). LAN A and LAN B can be fed separately and in turn broadcast on independent and isolated SSIDs. 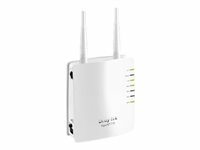 As the ports are all Gigabit, you can be sure that the AP is fed at the maximum speed in order to fully satisfy the full speed of both 2.4GHz and 5Ghz bands simultaneously. The four ports on LAN A are particularly of use if you are using the AP as a wireless bridge as you can then connect wired PCs or devices to it. LAN Port 3 on LAN-A is also used as the PoE input if you're powering the AP by PoE. Central Management The VigorAP 902 can operate in standalone autonomous mode, but can also form part of a centrally managed wireless installation by adding a compatible DrayTek wireless controller (a Vigor2860, 2925, 2952 or 3220). This enables you to centrally control, manage and administer multiple AP devices installed around your building/campus. Management also enables efficient usage of your wireless access point through load-balancing, whereby wireless clients are distributed across several access points to reduce congestion. Wireless Security & VLANs The VigorAP 902 features multiple levels of wireless security. Encryption using WPA2 (802.11i) is available and you can also use the access control list (ACL) to specify the hardware addresses of clients which are permitted to connect (by MAC hardware address). Any unauthorised hardware is refused access. AP Bridge WDS (Wireless Distribution System) - Connects two or more VigorAP Access Points or DrayTek wireless routers as a wireless bridge, allowing wired network devices to communicate across the link. The VigorAP can also broadcast a wireless network to increase wireless coverage. Power-over-Ethernet The VigorAP 902 supports PoE (Standard IEEE 802.3af Power over Ethernet) as standard (built-in) so if the AP is connected to a PoE-enabled Ethernet switch or PoE injector, you don't need any local power to the unit (power supply) - the VigorAP 902 will take its power from the Ethernet cable. The VigorAP 902 supports Gigabit PoE (if you have a Gigabit PoE switch/injector) such as our VigorSwitch P2261 or P1090 models (or any other 802.3af device). PoE is ideal for situations where you do not have mains power available in the exact location where you want to install the VigorAP 902 or just for general aesthetic neatness, perhaps where the AP is installed somewhere prominent. Dual-LAN The VigorAP 902 can support two completely independent LANs. Each is connected via its own independent RJ45 Ethernet interface. There are Ethernet RJ45 interfaces for LAN A (4 ports) and LAN B (one port). These networks remain completely isolated from each other. Each LAN can be assigned its own separate Wireless SSID so they remain separated even on the Wireless LAN. This is the equivalent of having two completely separate access points and ideal for public and private networks in the same location or wireless LANs for two separate companies. PoE for easy installation Power over Ethernet (PoE) support eases the installation by running only one cable to VigorAP 810 to deliver both data and power. You can mount VigorAP 810 to the place which is best for extending coverage without considering if there is ready access to a power plug. Of course, you can also use the included AC adapter if power is available nearby. WMM for Wi-Fi application prioritization DrayTek implements intelligent wireless prioritization technology on VigorAP 810 for best utilization of wireless coverage. VigorAP 810 supports Wi-Fi Multi Media standard (WMM). It is a standard created to define Quality of Service (QoS) in Wi-Fi networks. It is a precursor to the upcoming IEEE 802.11e WLAN QoS draft standard, which is meant to improve audio, video and voice applications transmitted over Wi-Fi. WMM adds prioritized capabilities to Wi-Fi networks and optimizes their performance when multiple concurring applications, each with different latency and throughput requirements, compete for network resources. 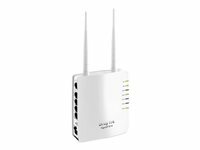 SSID + 2 VLAN groups for workplace security & parental control The VigorAP 810 supports 4 separate SSIDs and two virtual LANs (VLANs). You can set certain SSID(s) accessing Internet through either VLAN A or B (LAN A or LAN B in WUI). As a result, the VigorAP 810 divides itself into several virtual access points all within a single hardware platform.Many mobile networks deployed at corporate offices, hotels, shopping malls or restaurants can take advantage of this technology to support several applications such as public Internet access and inventory management. For example, guests of a company could be given wireless access for the Internet, but they are excluded from any access to the internal data server. For home users, they can set up different authorization for SSIDs to their K12 kids, young adults and parents to avoiding inappropriate contents accessed by underage family members. Comprehensive WLAN security control You can obtain the MAC addresses of each wireless client from its configuration utility or operating system. You then enter these addresses into a configuration page of VigorAP 810. When MAC address filtering is activated, VigorAP 810 performs additional check for wireless clients to prevent network breaking. Clients within the authenticated list will be able to join with the WLAN. Those who are not on the list will be denied while VigorAP 810 receives their request to join the WLAN. WDS for unlimited coverage extendibility The VigorAP 810 can extend over large areas (alike shopping mall) by its "WDS" (wireless distribution system). WDS takes care of the establishment of WLAN network with "point-to-point" and "point-to-multipoint" bridging and repeater modes. The repeater mode provides extend wireless access to additional clients where there is a relay AP repeats signal from a base AP to distant clients. The bridge-to-bridge mode allows two wired networks to be connected across some distance. The detachable antenna will let you replace with DrayTek antennas for directional signal shaping or mounting flexibility. Embedded USB printer server You can connect a printer to the USB port of VigorAP 810 for users from wired PC or wireless network. i.e. The laptop users can access printer for printing. When you are using a pair of VigorAP 810s to make a bridge, the said printer can be installed elsewhere in your office/ home. TR-069-supported VigorAP810 can work with TR-069 VigorACS SI Central Management The VigorAP 810 is TR-069 base. Hence, you can host VigorACS SI Central Management to manage several VigorAP 810 which were deployed remotely. Draytek Vigor AP 710 802.11n Wireless Access Point Bridge and Repeater. WMM for Wi-Fi application prioritization DrayTek implements intelligent wireless prioritization technology on VigorAP 710 for best utilization of wireless coverage. VigorAP 710 supports Wi-Fi Multi Media standard (WMM). It is a standard created to define Quality of Service (QoS) in Wi-Fi networks. It is a precursor to the upcoming IEEE 802.11e WLAN QoS draft standard, which is meant to improve audio, video and voice applications transmitted over Wi-Fi. WMM adds prioritized capabilities to Wi-Fi networks and optimizes their performance when multiple concurring applications, each with different latency and throughput requirements, compete for network resources. Multiple SSID with VLAN tag The VigorAP 710 supports 4 separate SSIDs and virtual LANs (VLANs). As a result, the VigorAP 710 divides itself into several virtual access points all within a single hardware platform. Many mobile networks deployed at corporate offices, hotels, shopping malls or restaurants can take advantage of this technology to support several applications such as public Internet access and inventory management. For example, guests of a company could be given wireless access for the Internet, but they are excluded from any access to the internal data server. For home users, they can set up different authorization for SSIDs to their K12 kids, young adults and parents to avoiding inappropriate contents accessed by underage family members. Comprehensive WLAN security control You can obtain the MAC addresses of each wireless client from its configuration utility or operating system. You then enter these addresses into a configuration page of VigorAP 710. When MAC address filtering is activated, VigorAP 710 performs additional check for wireless clients to prevent network breaking. Clients within the authenticated list will be able to join with the WLAN. Those who are not on the list will be denied while VigorAP 710 receives their request to join the WLAN. With industry level security standards for wireless user authentication and data encryption, 802.11i (WPA2) offers strengthened and interoperable wireless networking security. The activation of 802.1x RADIUS (Remote Authentication Dial-in User Service) allows you centrally manage and store user names and passwords. You can ensure that only legitimate clients can be associated with corporate RADIUS servers. WDS for unlimited coverage extendibility The VigorAP 710 can extend over large areas (alike shopping mall) by its "WDS" (wireless distribution system). WDS takes care of the establishment of WLAN network with "point-to-point" and "point-to-multipoint" bridging and repeater modes. The repeater mode provides extend wireless access to additional clients where there is a relay AP repeats signal from a base AP to distant clients. The bridge-to-bridge mode allows two wired networks to be connected across some distance. The detachable antenna will let you replace with DrayTek antennas for directional signal shaping or mounting flexibility. Two networks can be bridged where it is not possible to run cables, for example, across a road (assuming sites are within wireless range of each other). Both locations remain within the same IP subnet. The AP-710 is placed within wireless range of another access point and can then extend the coverage of that network. For additional security, wireless access can be restricted to authorised users only by use of a unique username and password for each user. This is in addition the encryption provided by WEP/WPA etc. When the user first opens their wireless connection, the AP-710 will request their username/password and not permit access to the LAN or Internet without it. The AP-710 can use an external radius server to hold user credentials but also has its own built-in radius server to store up to 96 users. The AP-710's built-in Radius server can also act as a server to additional devices (such as another AP-710, meaning that you don't need to set up the same users up on several units). Mesh - Access points connect to each other. Eliminates ethernet cabling. Wireless Optimisation - Band steering: steers wireless clients to the faster 5Ghz band. Airtime Fairness: improves time management between wireless clients. AP Assisted Roaming: makes sure the devices are always connecting to the best AP. Plug-n-Play - Automatically configue new wireless access points into the network. Self-Optimisation - Nodes identify the best next hop and connect with it automatically.